Just when you think that the Government cannot get any more stupid, they go and prove you wrong! This makes the UK one of the first in the G7 to formally explore setting an even more ambitious target than its current one. It follows a report from the Intergovernmental Panel on Climate Change (IPCC), showing more rapid action is needed to reduce greenhouse gas emissions to avoid devastating risks of climate change to health and global prosperity. The UK is already a world leader when it comes to tackling climate change. We led the world with our Climate Change Act, and since 1990 we have led the G7 in cutting emissions while growing our economy on a per person basis. In 2017 we saw renewable energy generation at record levels, and we are among the world’s best in cutting our carbon intensity. But the government is determined to do more and our first-ever Green GB & NI Week will celebrate the progress we have made while challenging governments, businesses and civil society to rise to the task. During Green GB Week, Claire Perry will also highlight the economic opportunities of moving to an even greener, cleaner economy. There are already almost 400,000 jobs in the low carbon economy and this could quadruple to around 2 million, generating up to £170 billion of annual exports. This is why the government has put Clean Growth at the centre of its modern Industrial Strategy. 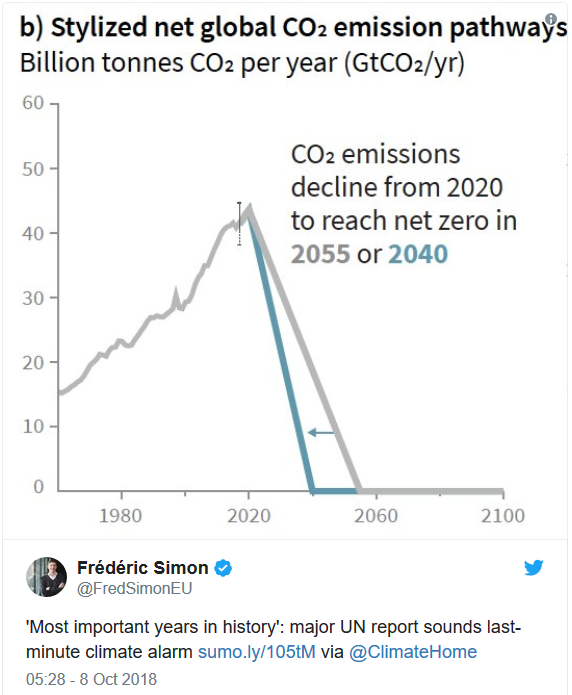 The stark truth is that neither the government or the Committee on Climate Change has the faintest idea how we are going to achieve the current target of an 80% cut in emissions by 2050, never mind eliminating emissions entirely. It is true that CO2 emissions have fallen from 596 MtCO2 in 1990 to 356 MtCO2 in 2016, a cut of 40%. However, nearly half of this fall, 118 MtCO2 occurred between 1990 and 2009, and therefore had little to do with the 2008 Climate Change Act, or climate policies generally. Between 1990 and 2009, emissions from industry fell by 45 MtCO2, largely because of the shrinking of our industrial base. Since 2009, industrial emissions have fallen by a further 16 MtCO2. So, of the 40% cut since 1990, 10% is the result of industrial decline. Nearly all of the rest of drop in emissions has been in the power sector. Between 1990 and 2009, they fell by 82 MtCO2. This was almost entirely due to the switch from coal to gas. According to DUKES, coal usage at power stations fell from 49.84 to 24.66 Mtoe, between 1990 and 2009. Gas usage increased from 0.56 to 30.9 Mtoe. Other changes in the power mix were insignificant. Since 2009, coal usage has declined to 5.55 Mtoe, while gas usage in the power sector has also fallen by 6 Mtoe. 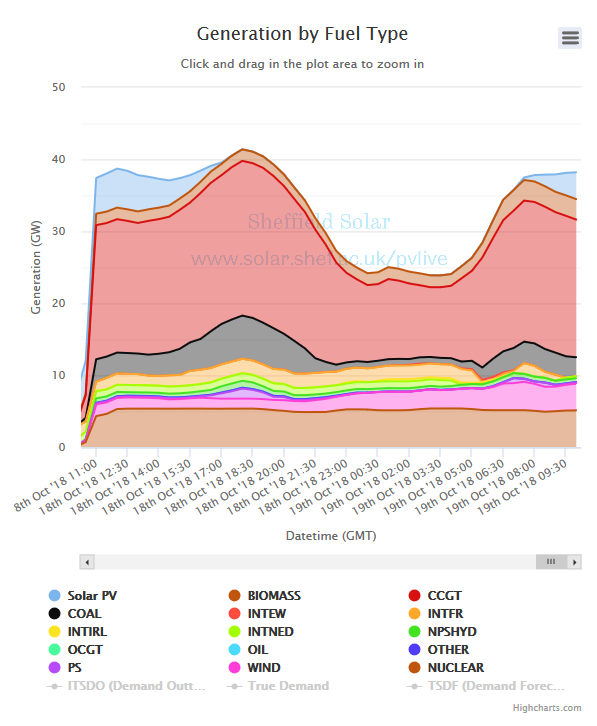 This is partly due to reduced generation and partly due to replacement by renewables. However, it is also worth noting that net imports have increased by 12 TWh, equivalent to 4% of electricity supplied. 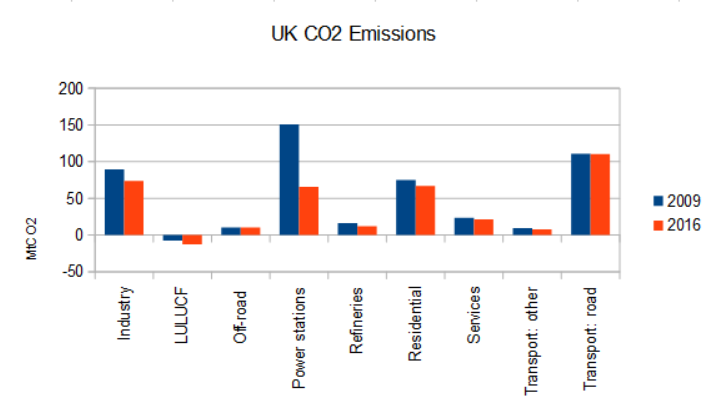 We must also remember that the official emission figures are understated, because biomass is treated as emission free. In reality, as many experts are now pointing out, CO2 emissions from biomass are real and just as high as coal power. According to DUKES, biomass used for power equated to 10.96 Mtoe last year, effectively cancelling out half of the emission savings from reduced coal power. There’s a lot of numbers here, but in short of the cut of 240 MtCO2 since 1990, probably only about 50 MtCO2 has been the result of decarbonisation policies. And this has come at a mammoth cost of £11.3bn this year alone. Yet the government now wants us to cut emissions from 356 MtCO2 to zero. Even if possible, how much would all of this cost? Even if the power sector could be made emissions free, there still remains the rest of the economy, where emissions have changed little since 2009. Claire Perry says we are the world leader in tackling climate change, but the rest of the world is paying precious little attention. In stark contrast to Claire Perry’s La La Land! ← Joe Pinkstone Says Beer To Double In Price Because Of Global Warming! Which, if she stopped to think for a minute, would result in massive amounts of CO2 being produced as we scrap old windows, loft insulation, petrol & diesel vehicles, gas & electricity meters, power stations and then manufacture and install new windows, more insulation, massive numbers of electric vehicles & farm machinery, smart meters and solar panels & wind turbines. Then there is the cabling needed to connect it all and the re-charging points. Hopefully, there will be some ‘Sir Humphreys’ in various Government departments who have the foresight and will not just ‘kick this into the long grass’ but kick it right out of the stadium. Sorry, but you are attempting to appeal with logic and cold hard facts to those who only have emotions. It fails with these nitwits as they only feed off the emotional highs provided by their peers who high-five and pet them for going along. Pixie Perry and thinking are two things I never pair together. Sadly, I have to concede that you are probably both correct. We really are stuffed and we are also really, really stuffed. Am glad to hear that down in Swindon, UK, not all government is like it and they are at least going to derive some electricity from their change in plastics waste disposal policy. No doubt the objectors will be out to protest. The BBC easily found one to comment at lunchtime. Can’t see much of a problem here really, I’ve only got a few yrs to go, my offspring are already in Canada, and all the nutters can keep themselves warm singing ‘Oh Jeremy Corbyn’ in the dark until the dole runs out. Is someone putting something in the HoC tea urns. MPs seem to be getting stupider by the day. Well done Philip for finding this. The vast amount of money our government is wasting on this insane quest for ‘net zero’ CO2 is just extraordinary. Whilst £11.3bn will be spent this year on it, how much will be spent in the coming years? Then how much will be spent on the equally insane quest to ensure EV’s are a success because they surely won’t just let that lie after making such grand proclamations. 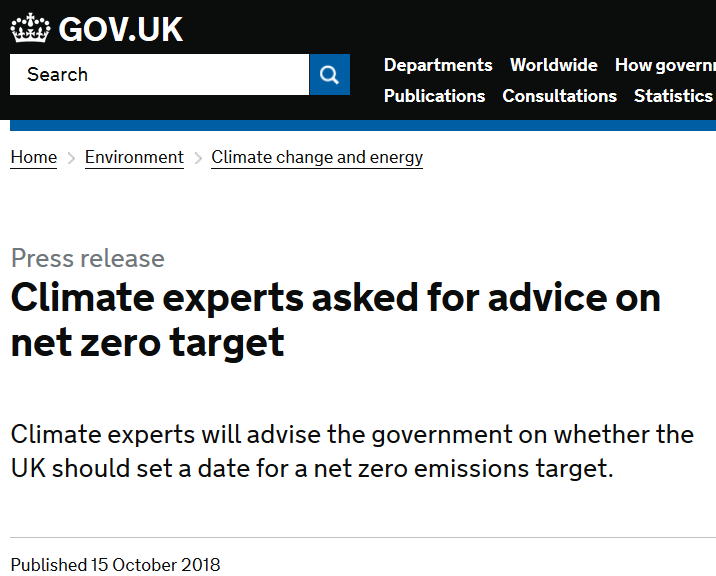 Now some idiot politicians are wanting the 2040 target brought forward to 2032. The SMMT estimate that from the 0.6% of EV’s on the road now it will require consumer appetite to grow by some 17,000% in just over a decade. What do our politicians think when they see extraordinary numbers like these? Other peoples money will solve it? Meanwhile, our NHS is screaming out for money. We embarked on PFI’s because, apparently, the country didn’t have the money to build new hospitals and schools, yet the money is suddenly available to spend on ‘climate change’. PFI’s have seen schools collapse in Scotland and new build hospitals abandoned when Carillion collapsed. The country has now suffered 10 years of austerity for Pete’s sake! Where the hell did all the money come from, so conveniently, to combat climate change? The NHS doesn’t need any extra money – it needs totally overhauling to cut out the huge waste that it has. PFI was brought in as a way of keeping the debts accrued off the books – hence it was so beloved of overspending Gordon Brown even though it was Major that thought it up. It also meant that unnecessary hospitals were built so that some Labour knob could go and open them and say ‘look how much we are spending’ when the better option was to invest in the existing buildings, but then who was interested in opening a re-decoration. Not a whole $2.4 trillion from the UK? I automatically get these Government alerts by email. You would not believe the huge amount of crap that is produced by the ‘civil servants’ every day. The ‘civil service’ is one big propaganda arm of the Greenblob, churning out nonsense on an industrial scale and believed by our gullible Government. Money is created out of thin air, by central banks, such as the US Fed, the European Central Bank & the Bank of England. It is then loaned out at interest, to govts, corporations & individuals. Usury. The Central Banks are privately owned, though various subterfuges make them appear to be a part of govts. ALL human efforts requiring loaned capital are, effectively, enslaved to Banksters. The Banksters have a chap called the Remembrancer sitting beside the Speaker of the House, Bercow, all day every day. This is the cause of our huge National Debt. This practice began, on a national scale, with the charter of the Bank of England, 1694. “European financiers” had plotted, with Cromwell, & financed the English civil war, culminating in William of Orange on the Brit throne. Dutchman,W. of O. agreed to have his personal debt, £1,250,000, placed on the shoulders of the English population, to be collected by a general taxation. This was the start of our National Debt. Or read for free on http://www.bibliotecapleyades.net by using the search box. “There are already almost 400,000 jobs in the low carbon economy and this could quadruple to around 2 million, generating up to £170 billion of annual exports”. Those sectors of the economy employ a lot of the 400,000, but have diddly-squat to do with Saving The Planet. The fundamental problem here is the Civil Service, which places its documents in front of the latest minister to sign. How could the Civil Service not get infiltrated by green activists, when that is exactly what has happened to the BBC, whose latest episode of Costing The Earth was a blatant party political broadcast for the Green Party. I wonder how much of this snowflake virtue-signalling will survive the catastrophe of the ‘no deal’ Brexit that we are heading for? Tax income will fall while government costs will increase leaving nothing to spend on stupid ideas. When it gets a lot colder? Notice that they are always for some target that is far enough in the future that they won’t have to deal with it? I’ll check back when I’m 103 and see how you are doing. Yet more government idiocy. Has anyone researched into the role of Wi-Fi and other electromagnetic ‘smog’ on climate change? I bet it’s having an effect, and I bet no-one will do anything because it’ll cost too much. CO2 is an easy target. Claire Perry who now is Conservative Minister of State at the Department for B.E.I.S. was described by George Monbiot of the Guardian as a firebrand who wanted to nationalise the banks and overthrow capitalism”. She now presides over UK Energy Policy and her pronouncements are suggestive of an avowed intent to bankrupt this country. Christiana Figueres, executive secretary of U.N.’s Framework Convention on Climate Change, also admitted that the goal of environmental activists is not to save the world from ecological calamity but to destroy capitalism. Ian, it would be very helpful if I could have a reference to that second one, the statement by Figueres. Was it on record? In the Guardian article? Can you help with a date? Thanks, in advance. Yes, but look at the dimwit who appointed her and the other idiot Clarke, our dimwit PM, who couldn’t negotiate a pint of beer out of a brewery. This is all grand standing to show off at the next climate bean feast of hypocritical climate activists. There is no way we can zero our emissions, ever. The National Grid has already said it cannot cope with a change to electric heating from gas. It has said it can cope with EV’s but this is blue sky thinking. Perry and Clarke are just showing off to their Green NGO masters, who tell our civil servants what our energy policy must be. We are probably the only country who is stupid enough who listen to them and do whatever they say. Since even the stupidest person knows that cutting off your legs will leave you immobile, you have to wonder what is the real agenda behind the climate crisis movement. They aren’t stupid, though a lot of followers are of questionable intelligence, but overall, no, the leaders aren’t stupid so what is the true agenda of these people? What, really, do they want for Britain and every other nation? It really isn’t money for the poor, so what IS it that they are after? Island Earth to belong only to a few chosen people? What is the desired result? Cristiana Figueres Admission is to be found reported in Wikileaks. Google Christiana Figueres, executive secretary of U.N.’s Framework Convention on Climate Change, under environment. The horror of the Left currently on the roll in the West and sensing victory, needs to be exposed in the National Interest. They’ are raising the cost of energy to un-competitive levels by forcing the West to introduce an ENERGY MIX of two completely incompatible systems renewable and conventional, thus simultaneously removing any possible introduction of Economies of Scale. By suing fracking companies trying to introduce some reliability into our electricity supply, they can have only one avowed aim, – to bring this country to its knees. Meanwhile they are aghast at the suggestion of nuclear energy being introduced because it might just be the solution we all need. Through unrealistic emissions regulations they are on the way to destroying all car manufacturing. They are currently targeting the Plastics Industry on which our current living standards hugely depend. They infiltrate right-Wing government intent on destroying it, and they are not stupid. Their final trick will be to further mis-inform the public through its televised mouthpiece, and then by subversion of the Legal System, sue democratically elected governments for failing to carry out the misguided electorate’s supposed legitimate wishes. Just as currently in Venezuela, – the avowed aim of the Left is destruction and grinding impoverishment of us all, from which only its rulers benefit. For their own selfish idealistic motives and very cunning, – they are not supportive of their electorate but instead completely contemptuous. Part of the reason why carbon dioxide emissions have fallen while GDP has increased is because the economy is more focused on services and less on manufacturing. 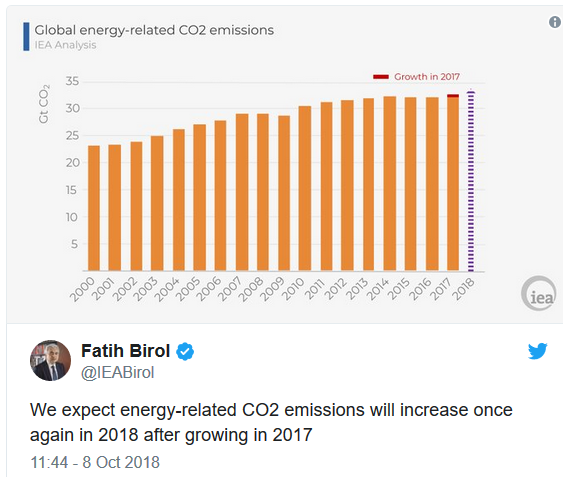 Since we now import more goods all this means is the emissions have been shifted somewhere else (potentially the same for imported electricity unless it is French nuclear). Therefore on a global scale a lot of our “cuts” will have just shifted emissions and not reduced them.